I make these around Christmas time for my Booth#555 at the Peddlers Mall. They are a steady seller. Especially at Christmas time because they are adorned with the yummy smell of cinnamon! Here's how I make them. I start out by making up a batch of salt dough. Knead it for a bit and get it all mixed good. If you want colored dough, you could easily add food coloring or something natural like coffee or tea. I prefer it plain for most uses. I then knead it out into a big ole baking sheet. 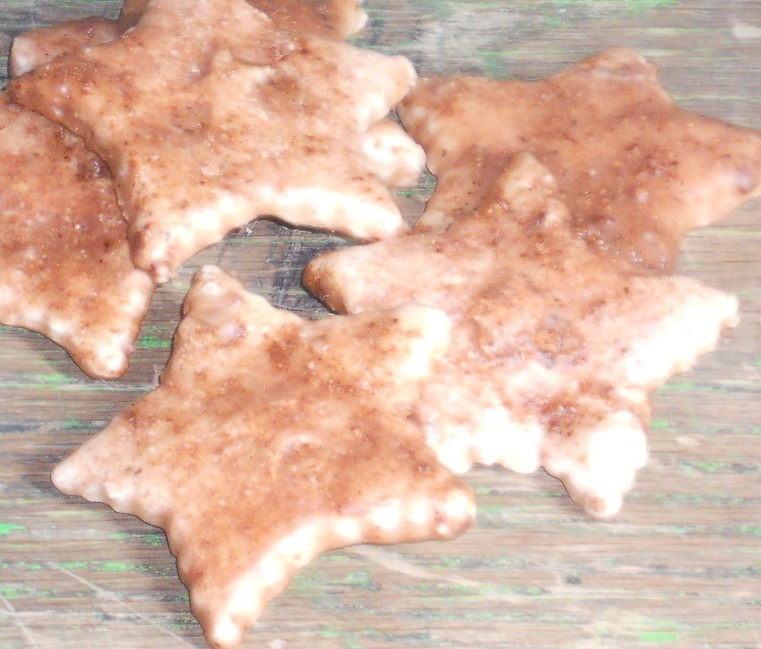 Then use my star cookie cutter to make the shapes. And then here's where I add a little extra. I take a small star stencil and press it into the center of the star. It just adds a lil extra touch and makes it cuter. And it's totally optional! and here's a closer pic of the star, after I pressed down on the stencil, just a tad bit. And repeated it on every other one, if you want. Next, it's time to do the dusting of cinnamon to make them totally smell yummy! I just spread them all out on the old baking sheet and sprinkle with some cinnamon sugar. 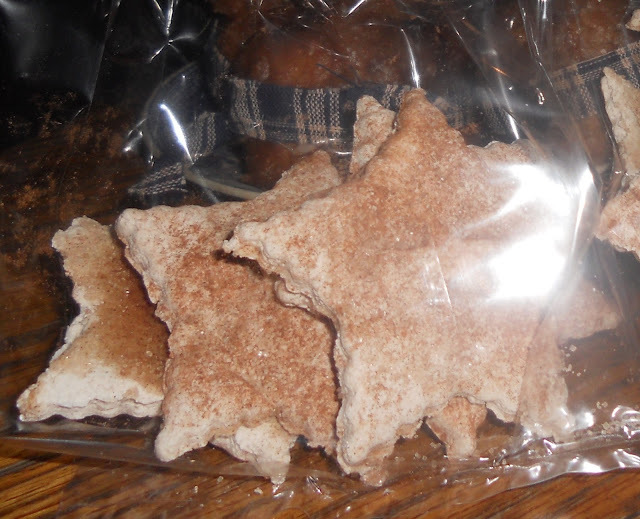 I press the granules down into the salt dough very easily to make it adhere, but not hard enough to misshape the star. Then I stick them in the preheated oven at 300* for about 45 minutes. Sometimes more, sometimes less. It mostly depends on the thickness of the salt dough. The just take them out and let them cool, then package as desired. The wax just makes them appear way smoother, kinda like a wax tart. I love it! Yet, if you opt out of dipping them in wax, you get a more grungy, prim look! Oh, I just can't decide which way I like best. lol. Ah, I think my favorite is the dipped in wax finish! Have you ever made anything from salt dough before? I have never made salt dough before. I thought about making salt dough ornaments for my tree one year, then never got around to it. No, I've never made a thing from salt dough. I would never have thought to make something like these but I will now, they look pretty straight forward. I agree I also like the ones dipped in wax, I can see the difference in the photos. Thanks for this post, you've given me some ideas. Hi Michelle and keep in mind, the many different cookie cutter shapes out there, the styles could be endless! It is really as easy as it sounds, mix, shape, bake then if u want the cinnamon or wax. But after you bake, u could always go with painting them as well. I tried making these, but mine puffed up, rather than staying flat... Yours are so much cuter!! Where do you find the treat bags at Walmart? Yes thank you! I'll look next time I'm there!! What kind of wax do you use to to dip them in? How do you make it so the bottoms do not have one big glob after you dip them and lay them out? I give them a quick dip, in and out, and I guess they don't grab a lot of wax. Then I lay them out on wax paper to dry. And when dry they havent yet had globs on the bottom, so I'm guessing it's where I dip in and out quick.